Multiplayer is not available right now, I forgot to add the new version to the supported versions list... I'll do that once back home. Quick initial impression is that AI editing is better now. Thank you and well done! Dunno if you fixed that in 8.2, sometimes while you can see matches (unwatched or maybe other too) the font of name of the map changes from Caps to normal letters. I like the display of the stats when I select a bot. But it takes up a lot of screen real estate. It visually blocks me from selecting the next bot from the battlefield. Even though I can still select bots through the tooltip. Once a beginner gets used to the type of bots I don't think they need to see the stats all the time. Maybe put a "i" symbol that I could click on to display the stats? So I can toggle the info on and off? 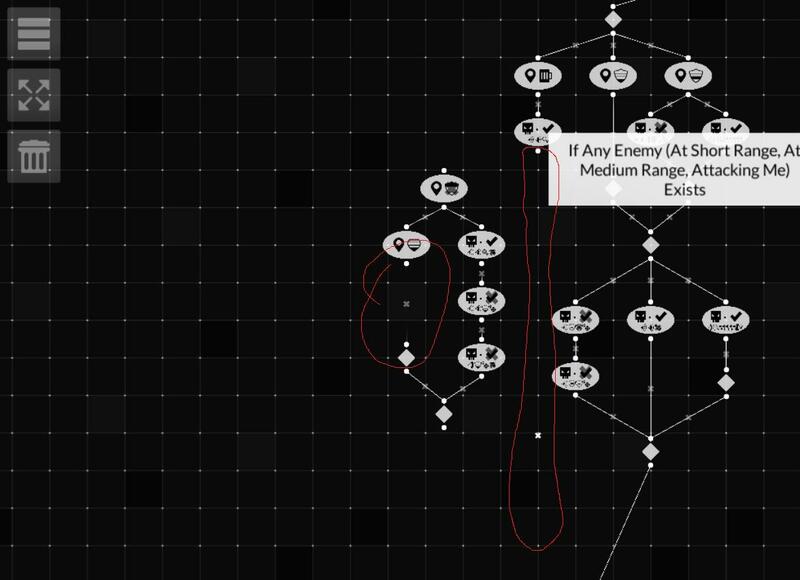 The new layout has such a bug that when you scale AI Editor screen the connections between nodes become slim and barely visible, then again visible if you scale more, and it's switching over and over. Only if you make the scale really big you can clearly see the lines. Same with AI preview during a match. I can confirm both of buzzefall's points. Machine gun assumes a weird position when viewing in fast forward. The bot stats don't appear when the type selector is on the left hand side of the screen. Yup, MG looks very well fed now. Here's all four next together for you. Chunkymonkey wrote: Not sure if this is a bug. Yeah. I thought it was strange. Unless it's in that position to exploit the move while shooting strategy from a long time ago. No exploits. It's just struggling to hold up that new HEAVY design. The new editor is so much faster when working with hugh AIs, awsome. One point when working with this snappable grid. When I define a new node it's not snapped. Would be cool if the initial position of nodes is snapped to the grid. And one suggestion. If there would be a possibility to mark all matches as watched. Most of the times I want to watch the match but sometimes I know the result when reading the players name. Currently you select a bot to watch its AI. Then you select the current subtree and again select the current subsubtree. (the really small triangle - often you have to zoom) Then you try to figure out whats going on. If you accidentally deselect the bot you start over. When to officially release Alpha 8? It seems that only about 10 players are in alpha 8 now and I don't want to match with same opponents for another month.